Thank you again for the wonderful invitations you made for our wedding, they were the talk of the table at our reception. Such a professional job excellent service, I will certainly be recommending your services to our friends and family. Once again can I just thank you for your wonderful service and commitment you gave us with the end result being our excellent invitations for our big day. Your professionalism Jozene meant that it was one more thing we did not have to worry about approaching our wedding. Thank you for your service Jozene, our wedding invitations and place cards were everything and beyond we had hoped for. Made2Matter requires that each customer understands the following before ordering. Prices include envelope and printing where applicable. Samples are as per individual price. Postage on samples is free. Customer understands that colours in the images displayed on the website may vary slightly from the colours of the final product. Clients are advised to order samples befopre placing a full order. 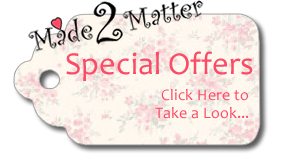 Allow upto 8 weeks for delivery for wedding stationery, due to the handmade nature of Made2Matter products. If you require your order any sooner please contact us. All products are handmade and for this reason the products may vary slightly from one example to the next, but this will be kept to a minimum. This is what makes your stationery unique. A 50% deposit (of order value) is required when placing an order and is non refundable. A proof of each stationery item will be sent to you. The proof should be signed and returned. Revised changes must be made clearly in writing. Any Changes made once the proofs are signed off may be subject to additional costs. Significant changes to your order will incur additional costs as this may involve purchasing additional materials. Once the order is complete, you will be informed and payment will need to be received and cleared before dispatch. Complete wedding orders are dispatched by Royal Mail Special Delivery. Delivery charges vary in accordance with order size. All orders are carefully packed to avoid any damage in transit. Any damage must be reported within 24hrs of receipt. If there are any discrepancies with your order or you are not satisfied, please notify us wthin 24hrs of receipt. We cannot be held responsible for damage which occurs when you post the individual items to your guests. All items remain the property of Made2Matter until paid for in full.